Last year, MizzouThon students raised more than $307,000 at their main fundraising event, a 13.1-hour dance marathon. This year’s main event will take place on April 6. COLUMBIA, Mo. — Leaders from MizzouThon, a University of Missouri student-led philanthropic organization, have announced that the organization has signed a $1.3 million pledge to help with the future expansion and renovation of the Neonatal Intensive Care Unit at the MU Women’s and Children’s Hospital, including purchasing new specialized beds that help reduce stress on newborns and families. The funds also will support the hospital’s music therapy program. Last year, MizzouThon students paid off their five-year $1 million pledge to the Neonatal Intensive Care Unit one year early. MizzouThon student leaders anticipate fulfilling this new pledge within five years. The new beds—Giraffe Omni Beds—would create an all-in-one neonatal care station for Neonatal Intensive Care Unit patients and staff. Each bed has the ability to change from a full-featured incubator to a radiant warmer and can provide easier access for mothers and hospital staff. Research has shown that the use of music can be helpful in managing patient pain and aiding patients in expressing emotions related to their hospital experiences. The Women’s and Children’s Hospital added music therapy services to its Child Life program in 2013. The hospital’s music therapist, Emily Herzog, has had more than 10,000 visits with pediatric patients and families. MizzouThon was founded in 2008 and is the largest student-run philanthropy at MU. The student organization works year-round to provide financial and emotional support to pediatric patients in mid-Missouri. The group’s main fundraising event is a 13.1-hour dance marathon where participants are required to raise a minimum of $100 before attending. Last year, the event raised more than $307,000. MizzouThon is part of Dance Marathon, a national organization with philanthropies at high schools and colleges across the U.S. 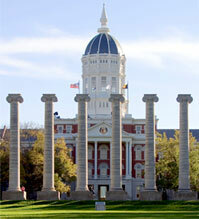 This year’s MizzouThon will take place on April 6.